Why join Indochina sails Halong Bay cruises? The amazing Indochina cruises were designed in elegant, traditional and luxury travel style, based on the standards of 5 star hotels on land. Go on Vietnam holidays. 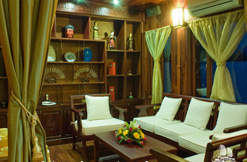 Book Halong Bay tours by Indochina Halong bay cruises - the highlights of luxury Vietnam tours. Then, go home. It is worth flying thousands kilometers. Enjoy the greatest monents in your life. Limited offers for Indochina cruises - The highlight of Vietnam luxury travel. If you want to create the highlight of luxury travel for your life, join luxury Indochina Halong Bay cruises. Ms Indochina sails were built to satisfy the discerning travelers. Wooden junk with traditional wood carving decors. 40m long, 8.5m wide, 19m hight, 2.5m deep. 14 luxury AC carbins, large ensuite marble bathrooms. incredibly elegant dining room and cozy bar. large sundeck with comfortable lounging furniture. Tender boat for health immergency case & doctor on call. Probably best Vietnamese cuisine including fresh local seafood & international choises. the food satifies both your eyes & stomach beyond your expectation. Multi-choices from soft drinks to high-grade kinds of wine. Vietnamese traditonal spa in kingly style. Most importantly, they are so friendly, hospitable & willing to work. Individual air conditioner remote control. Cave explore by walking & Bamboo Row Boat. Swimming, Kayaking & Snorkeling . Morning Tai Chi and Yoga Practices. Passport with valid visa to Vietnam. Visa, Master Card, American Express are accepted. Book Halong bay tours by Indochina cruises, the best Halong Bay cruises, just one time to remember uniquely luxury experience all your life. Ms Indochina sails were designed to serve the most sophisticated travelers. If you are not fully satisfied with Halong bay tour in Vietnam luxury travel style, you will have money back. Experience some of the best days in your life by cruising Halong bay in Vietnam luxury travel style provided by Indochina sails Halong Bay cruises - the highlight of all luxury Vietnam tours.